The design of Windslicer paddles is closely based on the subtle features seen in native paddles dating from the 1600's. with round, tapered pegs and bound by closetwine whipping. Bone edges and tips on this paddle protect against ice and the blade is not fluted which is a more common profile. 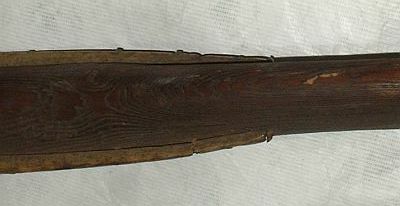 At the 'shoulder' where the blade meets the loom, the bone edges are not recessed on this paddle so that a sliding stoke would not be easy or smooth to perform. Even though the bone edges have been tapered at the ends they present an interruption to a sliding hand. When a sliding stroke is a priority, the transition from the loom to blade edge must be as smooth as possible. 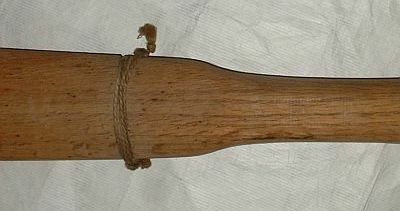 The normal hand position for a Greenland paddle partly covers the start of the blade so that in this example, where the bone edges extend to the loom, there is no obstacle and the transition is smooth. A sliding stroke would be easier with this paddle. A drip ring for water would make an interruption for the hands for easy sliding and in this example an attempt has been made to reconcile these conflicts. The blade is not edged with any reinforcement and thin twine has been recessed in a groove running around the blade near its end. This paddle could be used in sliding stroke mode but would probably be uncomfortable for any length of time. Native paddles would have been more often used with a gloved hand. Notice that the twine has been knotted at the blade edges to induce the water to drip off just before the hand position. Where the end of the blade is a prounced step, as in this example, it provides an easy-to-feel place on the paddle for the user to ensure their grip position without having to check visually. It is, at the same time, a smooth step, so that a sliding stroke remains practical. Standard Windslicer paddles have a smoothed 'shoulder' with oak edges to the blades. Edge view of Windslicer paddle 'shoulder'. The oak edges are glued with epoxy resin and pinned with bamboo.